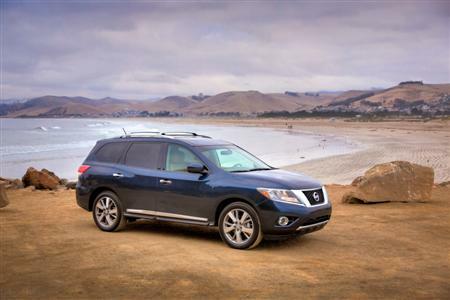 Nissan has released local pricing* and initial product information for its new Pathfinder SUV range. This new generation Pathfinder brings a long list of innovations and enhancements, including a stylish exterior, flexible interior features and a uni-body design, delivering a pleasant driving experience and improved comfort. This all-new cross-over is scheduled for local release in October 2013 and will go on sale with a starting price of $39,990*. Stylish and clever, the all-new Pathfinder’s core design departs from its predecessor’s utilitarian, off-road-biased ladder frame lay out. Available in both two- and four-wheel drive, the latter with Nissan’s ALL-MODE 4x4-i system, the new Pathfinder retains the ability to go anywhere but with the type of comfort and various technologies Australian buyers expect in this all-important market segment. The Nissan Pathfinder is among the latest all-new products in Nissan Australia’s continued series of new-model introductions. The leading car maker will launch two other innovative and exciting new vehicles in the coming months, the all-new JUKE urban cross-over and the Altima mid-size sedan, both set to arrive shortly. Powering this all-new model is a responsive 3.5-litre V6 petrol engine with Nissan’s next-generation X-XTONIC CVT (Continuously Variable Transmission). Three model grades are available: ST, ST-L and Ti, each with the option of two or four-wheel drive. Full standard and optional equipment details will be announced shortly but the all-new Nissan Pathfinder comes impressively equipped and includes Nissan’s clever EZ Flex™ seating system.